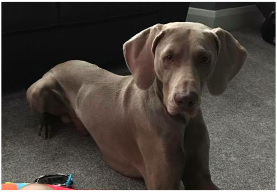 I currently have a 3yr old weimaraner male back with me for rehoming. Scooby is a fantastic dog and is sadly back with me through no fault of his own. Family life had changed and become very busy, so in Scooby’s best interests he came back here with me.